Cherry season is preciously short, and, where I live, it’s right now. It’s probably nearing the end of the road for them, actually, as all things fruity seem to appearing and disappearing early this summer (due to the 60° winter we had, no doubt). I’m going to the greenmarket tomorrow to find more tart red jewels before they go bye-bye till next year. I’m deciding these days that I find crisps to be as satisfying as pie, but with a lot less effort. Perhaps that makes them slightly more satisfying? Sounds lazy, but prepping cherries is a labour of love as it is (and usually leads to a t-shirt covered in red speckles) so I’m happy not to also deal with the clean-up involved in making crust. Soft fruit with a crispy topping of oats and brown sugar is hard to beat anyway. I’m also digging this combination of sour cherries and pistachios, but some roughly chopped almonds would be a fine stand-in if you don’t have the pistachios on hand. Steph’s Notes: I made a half recipe in a smaller baking dish. It took less time to bake than the full recipe did, about 35 minutes in total, and I turned the oven down to 325°F for the last 10 minutes to keep my topping from getting too brown. -Preheat oven to 375°F. 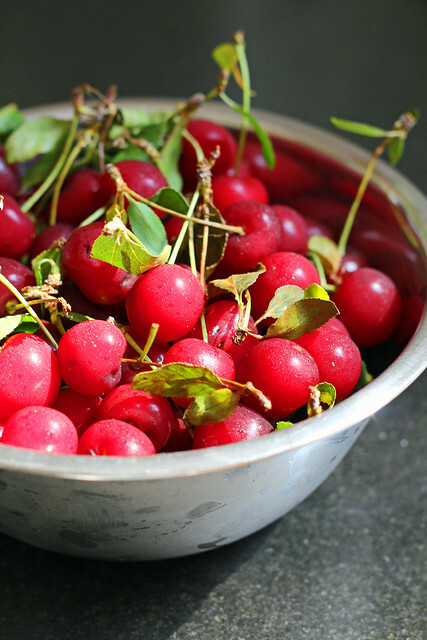 If using frozen cherries, spread them in a single layer on a rimmed baking sheet. Let stand at room temperature until cherries have thawed almost completely but still hold their shape, about 30 minutes. Drain off any accumulated liquid. If you are using fresh cherries, just stem and pit them and you are good to go. -Whisk together the pistachios, flour, oats, baking powder, and 1/4 teaspoon salt in a medium bowl; set aside. Put butter, brown sugar, and 1/4 cup granulated sugar in the bowl of an electric mixer fitted with the paddle attachment; mix on medium speed until creamy…this is not hard to do by hand with a wooden spoon, if you choose. Stir pistachio mixture into butter mixture until just combined. Work mixture through your fingers until it forms coarse crumbs ranging in size from small peas to gum balls. Chill topping in the refrigerator for at least 15 minutes. You can even make the topping the day before and hold it in the fridge. -Stir together cherries, remaining 1/2 cup granulated sugar, the cornstarch, cinnamon and a pinch of salt in a medium bowl. Transfer cherry mixture to an 8-inch square glass or ceramic baking dish. Sprinkle the chilled topping evenly over cherry mixture. Bake until topping turns golden and juices are bubbling, 50 minutes to 1 hour, turning at the half-way point. If you notice that your topping is browning too quickly, turn the heat down to 325°F for the remainder of the baking time. Let cool on a wire rack 1 hour before serving. A little ice cream on top is a fine idea. I love your blog and so I nominated you for the Beautiful Blogger Award! I love all these things separately and now I’m pretty sure I need to try them all together! This looks and sounds perfectly awesome! I think I’m about to make that crisp, sounds delish. No cherries here sadly (’tis winter) – but tamarillos (tree tomatoes) might be a good substitute. Desserts should be eaten after EVERY meal – there’s not enough days in a year to try all these yummy looking creations! 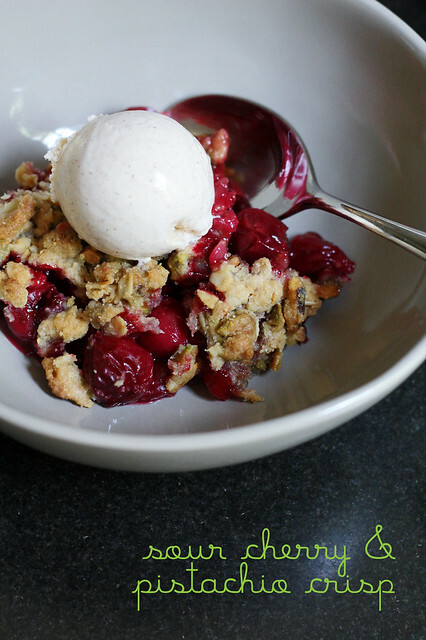 This looks absolutely amazing, I love any dessert with cherries! Hi. I just did a straightforward half of the ingredients and reduced the baking time a bit. See my note at the very start of the recipe about baking time.